If you complain or object to illegal conduct of your employer, you are protected from retaliation under New Jersey's whistle-blower laws. The New Jersey Conscientious Employee Protection Act (CEPA) makes it unlawful for an employer to take adverse employment action against an employee who discloses, objects to or refuses to participate in illegal actions of his or her employer. If your employer terminated, demoted, harassed or otherwise retaliated against you as a result of your objections to illegal conduct, we may be able to pursue a claim for the damages caused, including lost wages for the past and the future. 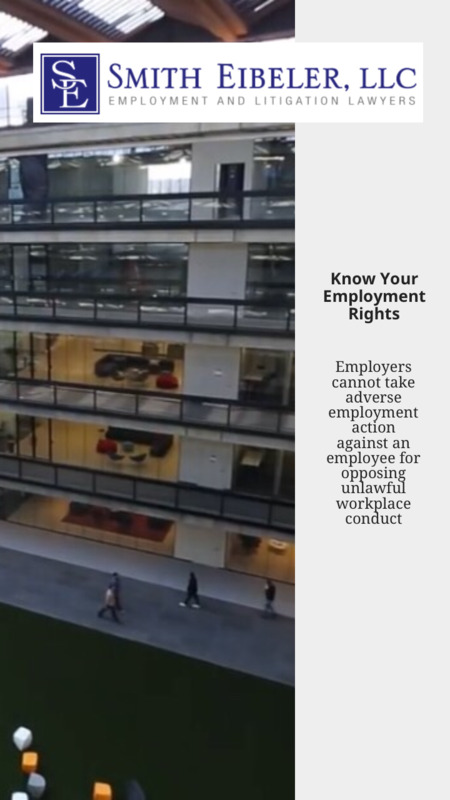 Often times when an employee does the right thing by reporting illegal conduct of their employer, they are subjected to adverse employment action, up to and including, the termination of their employment. Under New Jersey state law, an employee is protected from retaliation from complaining or objecting to an activity, practice or policy of their employer that the employee reasonably believes is illegal. Smith Eibeler has successfully represented workers who have been retaliated against or wrongfully terminated after opposing or reporting their company's illegal actions. If you suffered retaliation for reporting what you reasonably believed to be your employer's unlawful actions, we are here to help. If you believe you were terminated for standing up to your employer concerning an activity, policy or practice that you believed to be illegal in violation of New Jersey's CEPA law, our lawyers are here to listen to the facts of your case and pursue compensation on your behalf for lost back and front wages, emotional distress and other damages against your former employer if actionable. To learn more about how we can help you, please contact us to schedule a consultation with one of our experienced employment attorneys.